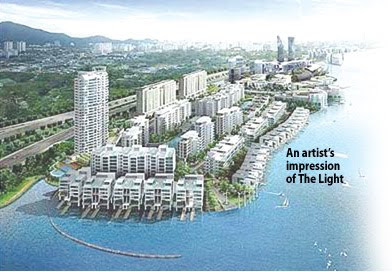 PROPERTY developer IJM Land Bhd remains optimistic over demand for its Penang projects this year, as it continues to unveil new offerings within its "The Light" waterfront project on the island. "The fact that our site is protected from tsunamis is yet another advantage," said its managing director Datuk Soam Heng Choon. Several parts of Malaysia, including the islands of Penang and Langkawi, were hit by tidal waves, resulting from of an earthquake near Sumatra, Indonesia, in December 2004. Soam said iconic landmarks such as a digital hub, boutique hotel and a convention centre will set The Light apart from other waterfront developments on the island. The Light, which is a RM5.5 billion mixed development project, is being carried out on reclaimed land north of the Penang Bridge. Phase 1, which sprawls over 16ha, comprises residential units and is expected to take six years to complete. One component of this phase, which will set IJM apart from its competitors, is the 19 units of seafront designer bungalows tagged at RM15 million each. The units are due to be launched by the end of next year. The second phase encompasses 41.2ha and will take 15 years to be developed. The project's The Light Linear condominiums, which were soft-launched in July last year, saw non-Bumiputera units sold out within the day. 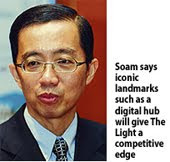 "As for The Light Point luxury condos, which are due to be completed by December next year, about 65 per cent of the units have been sold since its soft launch last month," said Soam. The Light Linear units, which are priced between RM522,000 and RM730,000, have been snapped up mostly by local buyers, he added. "We are planning for overseas roadshows in Beijing, Shanghai, the Middle East and Singapore this year, and these will (focus) mainly on the second phase of The Light where we plan to target potential investors and en-bloc buyers." The Johor hub is expected to help facilitate two-way visitor flow between its Resorts World Genting development in Pahang and its soon-to-open integrated Resorts World Sentosa. Gaming group Genting plans to set up a hub in Iskandar Malaysia, Johor, that will feature a mall with premium outlets in the first phase and, later, hotels and a theme park, its chief said. 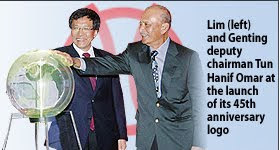 "Under (our leisure unit) Genting Malaysia Bhd, we are working on how we can invest in Iskandar in terms of creating a hub," Genting Bhd chairman and chief executive Tan Sri Lim Kok Thay told reporters after launching the group's 45th anniversary logo in Kuala Lumpur yesterday. The hub in Johor is expected to be a mid-way point to help facilitate two-way visitor flow between its Resorts World Genting development in Pahang and its soon-to-open integrated resort in Singapore, Resorts World Sentosa. The proposed project in Iskandar has been approved by both the state and federal governments, Lim said. The mall, to be known as Chelsea Premium Outlet, will be operated jointly with US firm Simon Property Group and will be the anchor of the whole project. It is expected to open next year. "If we can attract tens of millions of visitors to the outlet, then all the supporting facilities (like hotels and theme park) can be built and be profitable. We plan to build a whole resort experience around the anchor," Lim said. Genting unit Genting Plantations Bhd has some 4,050ha in Kulai on which the group can expand, he said. Genting Plantations last September formed an equal partnership with Simon Property, the US' largest mall operator, to establish the mall comprising designer brand discount outlets in Kulai. Genting's initial share of investment in the project is small, at RM200 million, said Lim. He said the group had already signed up some 60 outlets for the first phase of the mall, which is the first of its kind in this region. Similar malls in Japan and South Korea, located outside of the city, have been very successful, Lim noted. SUNWAY Holdings Bhd’s unit SunwayMas Sdn Bhd has entered into a deal to buy a 60 per cent stake in property firm Spanland Sdn Bhd from Templer Forest for RM13.8 million. The deal outlines the joint venture (JV) of SunwayMas and Templer Forest to jointly undertake a RM500 million property development project on 98.43 acres in Rawang, Selangor. SunwayMas will fund the proposed acquisition and proposed JV through bank borrowings and internally generated funds.